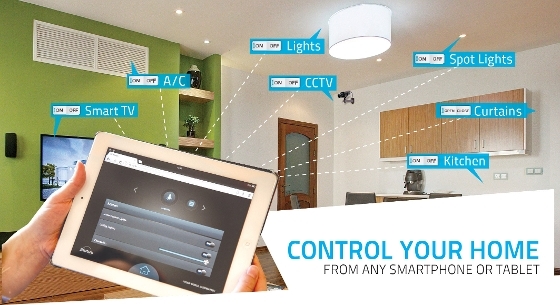 Home automation or smart home allows you to control systems in your home with a touch of a button. Where the first home automation systems were controlled only by a central panel, the latest in automation and mobile technology now allows homeowners to control their system from anywhere using a smartphone, tablet or computer. Home automation can be installed during construction of a new home and in existing homes. Home automation can enhance your lifestyle and enjoyment of your home by adding luxury and convenience, enabling you to control things like lighting, blinds, temperature, music and video. They can also help protect your home and family through high-tech security systems and help you save on energy bills through energy efficient programming. What exactly can I control with home automation? Lighting: You can enhance the enjoyment and property value of any home and business. Start saving energy and money, lights can be controlled by a keypad in your home or from your smart phone, when you’re at home and when you are away. This is also a great security feature as lights that come on and off indicate to potential intruders that someone could be at home. Home security: The key to peace of mind. You can lock and unlock doors automatically when arming or disarming your system, program them to lock at the same time every night or unlock the same time every morning for a babysitter. Temperature: You can program the temperature in your home to increase and decrease during certain parts of the day, helping you to conserve energy and save on your utility bills. Window coverings: Automated blinds can be programmed to open automatically when you come home, close when the sun goes down or to open sporadically throughout the day to make it appear like someone is at home when you are on vacation. You can program your blinds to open and close at specific times of the day to best match your schedule. Home theatre systems: No 'smart home' would be complete without the right audio to compliment your lifestyle. Imagine having an authentic theatre experience in your own home! Your family will love watching movies and video complete with quality visuals, surround sound and portable touch controls. Music: Gain automated access to your playlists on your iPod, internet or computer or play radio channels in any room of the house – all controlled by a portable control or your smart device. Your music & multimedia devices are intelligently automated, so you can just sit back, relax and enjoy. Have your whole house or individual rooms welcome you as you walk in, playing your favourite playlist on entry. You can have a complete home automation system that is made up of all of these components, and others, or choose the components that best suit your needs and budget. Home automation could also boost your property value and could attract quality home buyers, should you ever decide to sell your home.